ScienceSeeker | Science News Aggregator: The ScienceSeeker Awards 2019 are open for entry! After a successful relaunch of the ScienceSeeker Awards last year, we're delighted to announce that it now returns for its third iteration! We hope that these awards will be a way to feature several of the most outstanding blog posts, podcasts, or videos from the past year, and highlight the widespread talent in the science blogosphere that ScienceSeeker seeks to promote. The nomination process will run from January 17, 2019 through midnight Pacific Standard Time on March 1, 2019, so, really, the evening of February 28 is the time for last minute nominations. The ScienceSeeker team will collectively determine the winner for each of the nine categories, as well as the overall grand prize winner. The winners will be announced on April 1, 2019. 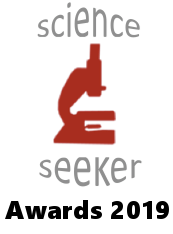 Any post, podcast episode, or video that was first published between January 1, 2018 and January 1, 2019 are eligible for the ScienceSeeker Awards. The post can be from anywhere, be it a personal blog, an institutional website, or a large media organisation. If you’re entering and are not already in our bundles, why not submit your site here?